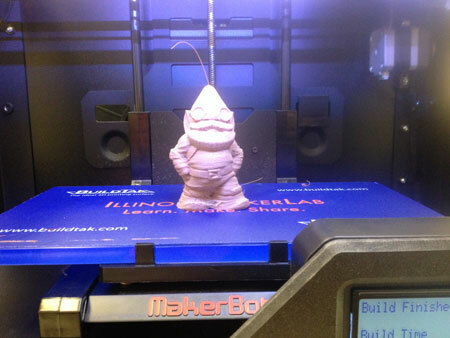 (Nanowerk News) One of the questions that visitors to the Illinois MakerLab often ask is: “What types of materials can be 3D printed?” Most are surprised to hear that 3D printers can print a wide range of materials, including plastics, metals, ceramics, paper, food, and even biomaterials. However, most desktop 3D printers have been traditionally limited to various types of thermoplastics. For example, the MakerBot Replicator 2 printers used in the Lab mainly make objects out of PLA, which is a corn-based polymer. Although this material can be used to print a variety of both fun and useful objects, an expanded array of materials are in the process of development. The team has begun to experiment with new materials. For example, they recently acquired a wood-based polymer called Laywoo from Inventables. This new material is fed through the 3D printers just like plastic but produces objects that look like they were carved from wood. The photo above shows a wooden gnome that was printed from this material.